Planning a family brunch at home can be a burden. Putting aside the family dynamics, the question that must be asked is what will you serve? For families on a budget, the traditional Easter ham and sides followed by the bountiful desserts can empty a wallet. 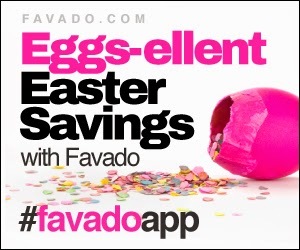 This year the Favado app brings families eggs-cellent savings. Favado is a grocery app that shows the user what is on sale at your local grocery store. It is a fast, easy way to compare prices, get coupons and save on your grocery bill. From the dozens of eggs to dye to the sides for the Easter ham, Favado will help keep the food budget under control. As a busy mom, I don't have the time to scan all the ads for the best deals. Even if I had the time, it seems like I always miss something. With the Favado app, I can search for stores, items or even keep favorite items on a watch list. Plus, the app can alert me to special items on sale. Now while I'm waiting at the swim practice, I can make my shopping list and pocket some savings. The extra savings can go to buying me a new pair of shoes. With Easter around the corner, it seems that every store is having a sale on eggs, ham and Easter candy. The sales and advertisements can become overwhelming. The Favado app simplifies the prices and store in your fingertips. Now I can decide whether that one cent savings is worth the 15 minute drive. The convenience of the Favado app on a smartphone makes even last minute shopping easy. Busy weeknight dinners can a mess. No one knows what to eat. With the Favado app, dinner can be the best weekly grocery store sale. Simple and easy. This Spring simplify the Easter brunch shopping list with savings from the Favado app. It might not help with Aunt Edna's complaining, but the extra savings could buy a relaxing spa day Easter Monday. Disclosure: This post is brought to you by Favado. The content and thoughts are original. I could really use an app that helps find the savings and deals. Thanks for the great post. This seems like a great tool for saving money! Thanks for sharing! This sounds like an awesome app! Holiday dinners are usually so expensive because we have such a big family dinner. I'm always looking to save on the biggies, like the ham and all the eggs.